Borneo Fashion Week (BFW) 2018 will run from 7 to 9 September 2018 in Kuching, Borneo. On the 30th June, BFW unveiled a stunning fashion showcase, inspired by the bold and beautiful heritage of Borneo, at the luxurious Diplomat KL – a window into the upcoming BFW 2018 and signifying the fashion week’s evolution into its second year. Themed Luxe White Party, the pre-launch – officiated by Encik Hii Chang Kee, Permanent Secretary of Ministry of Tourism, Arts, Culture, Youth & Sports Sarawak – hosted a press conference to introduce guests and the media to its fashion week happenings in September 2018. Coming together to mark the fashion week’s pre-launch was founder and organiser Stephanie Alcantara and a host of renowned fashion designers from Malaysia, Singapore, Vietnam and Cambodia. 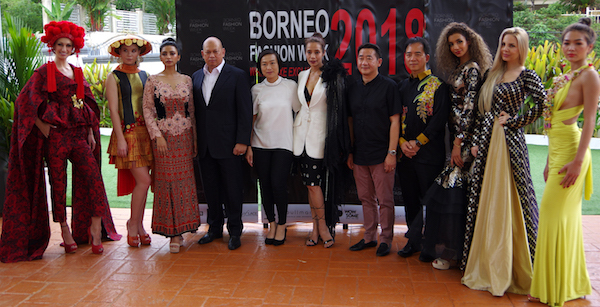 It was an intimate initiation to the upcoming fashion event, and to Kuching as a leading fashion destination, ‘ bringing Borneo to the world ’ through an extravagant fashion showcase.